Call Boat Owner Matt 781-424-2506. 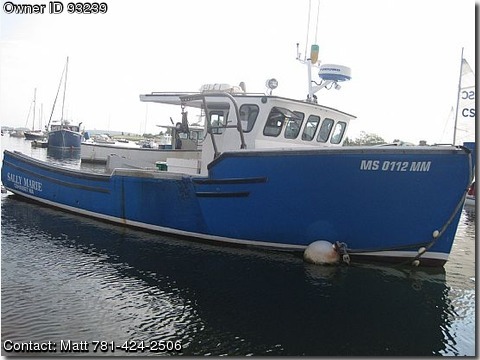 SS 2inch shaft, new engine 2009, life raft, epirb, open stern, new stainless exhaust, cruises at 10.5 knots at 2000 rpms, possible federal permit Fully equipped commercial lobster boat split wheelhouse, fiberglass hull, full electronics, including auto pilot, radar, plotter, and sounder. 2 vhf radios, stereo, heat.